embed signage supports multiple device platforms giving you the flexibility to choose the right hardware for your business. 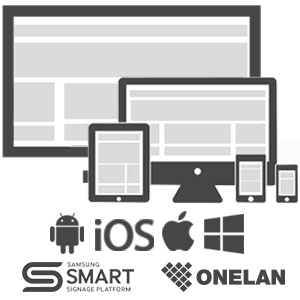 Currently embed signage supports Windows, Mac, Android, iOS, Samsung Smart Signage Platform D & E Series and ONELAN, with further platform support within our product development roadmap. View which devices are currently on and offline. Get an overview of the device operating system, native resolution and currently playing channel. Delve deeper into each device and discover more details such as embed signage app version, software version, connection type, device ID, IP address, date & time of last connection, device model number, location and add your own notes for future reference. Easily pin-point all devices on your account on the device world map. 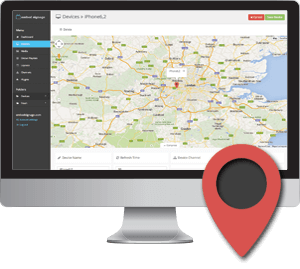 Geo-location is supported on iOS and, for all compatible devices, you can drag and drop the device location pin on the map to reposition it anywhere in the world, helping you gather a visual overview of where your devices are located. 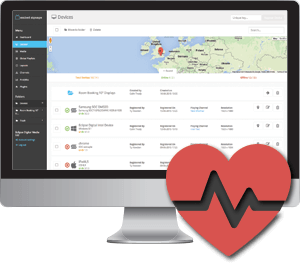 Create folders of devices to easily manage your digital signage network. Add or remove devices into relevant folders and see folder specific device status’ when selected. 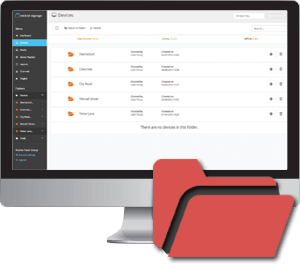 Create unlimited number of folders and sub-folders allowing you to segment your digital signage network as your see fit. Need to find specific devices? 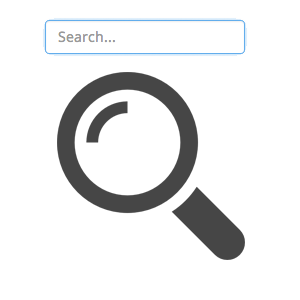 Use the embed instant search bar to find what you are looking for. Search for device name, device platform, resolution, user that registered the device to your account and anything else then instantly see the results filtered.